We base our decadent Bolognese sauce off of a traditional Italian recipe pairing rich meat sauce with fresh, sautéed organic carrots, onions, and basil. 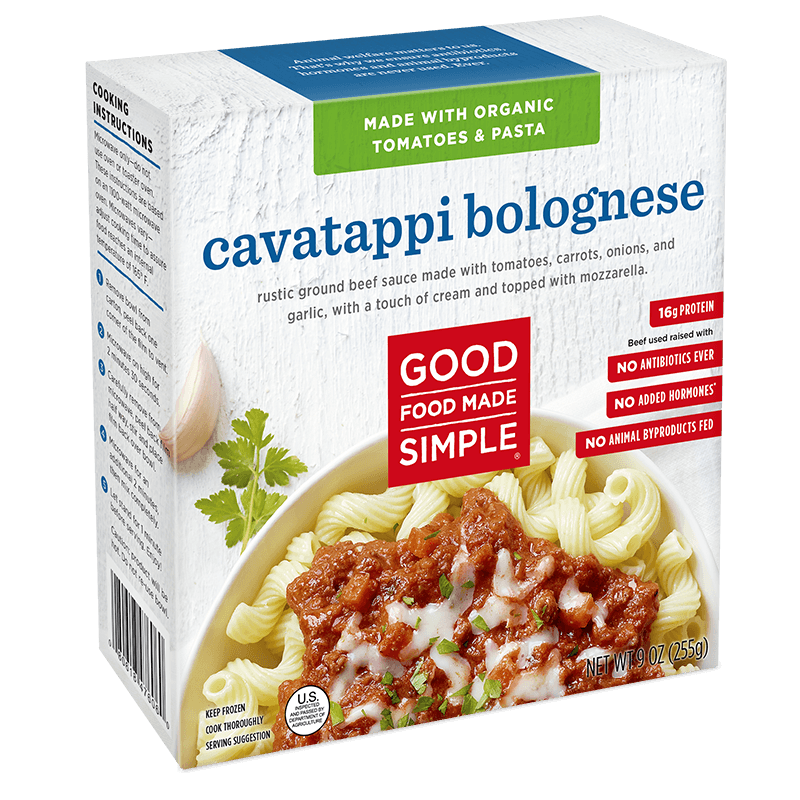 Tossed with perfectly cooked organic Cavatappi noodles and topped with organic mozzarella, it’s a deliciously gratifying dish that’s been around for ages. Now, ready in minutes. BOLOGNESE SAUCE (ORGANIC TOMATOES [ORGANIC TOMATOES, ORGANIC TOMATO PUREE, SEA SALT, NATURALLY DERIVED CITRIC ACID], WATER, BEEF PATTY CRUMBLE [BEEF, WATER, POTATO STARCH, SALT], ORGANIC MILK [ORGANIC MILK, VITAMIN D3], ORGANIC ONION, ORGANIC TOMATO PASTE, ORGANIC CARROTS, ORGANIC HEAVY CREAM, ORGANIC BEEF BASE [ORGANIC ROASTED BEEF WITH BEEF BROTH, SALT, ORGANIC CANE SUGAR, NATURAL FLAVOR, ORGANIC DRIED ONION, ORGANIC POTATO STARCH, ORGANIC DRIED GARLIC, ORGANIC CARAMEL COLOR], ORGANIC PARMESAN CHEESE ([PASTEURIZED ORGANIC MILK, CHEESE CULTURES, SEA SALT, VEGETABLE ENZYMES], ORGANIC POWDERED CELLULOSE [ANTI-CAKING]), SPICES, EXTRA VIRGIN OLIVE OIL, GARLIC, CORNSTARCH, SUGAR), ORGANIC COOKED CAVATAPPI (WATER, ORGANIC CAVATAPPI [ORGANIC DURUM WHEAT SEMOLINA]), ORGANIC MOZZARELLA CHEESE (MOZZARELLA CHEESE [PASTEURIZED ORGANIC MILK, CHEESE CULTURES, SEA SALT, VEGETABLE ENZYMES], ORGANIC POWDERED CELLULOSE [TO PREVENT CAKING]).